Past Events "Getting Your Book Published"
How do you publish a scholarly book? Getting Your Book Published is a lecture/workshop opportunity to learn about the publishing process and network with faculty and graduate students from a variety of disciplines at Northwestern. 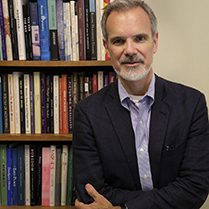 Alan Thomas is Editorial Director for the Humanities and Social Sciences at the University of Chicago Press. Over his thirty-year career as an acquisitions editor at Chicago, he has published a broad range of scholarly books in the humanities as well as fiction, poetry, memoir, biography, and photography. His authors have won the National Book Critics Circle Award, the Modern Language Association’s Lowell Prize, and the Phi Beta Kappa Christian Gauss Award, among many other awards. Alan is a contributor to Places Journal and has published on literature and photography in the Los Angeles Review of Books and Design Observer. He lectures widely on issues in scholarly publishing.